The National Women's Soccer League will kick off its seventh season this week. That's more than twice the number of seasons the two previous U.S. women's pro leagues -- WUSA and WPS -- played combined, and the league's longevity should be cause for celebration. But once again, the offseason was dominated by stories of the struggles the league and its clubs face. In 2017, it was the demise of the champion Western New York Clash, sold to North Carolina entrepreneur Steve Malik. Before the 2018 season, FC Kansas City folded and its players were moved to Utah, where Real Salt Lake owner Dell Loy Hansen started the Royals. But the big loss in 2018 was that of the Boston Breakers, whose soccer roots dated back to the WUSA in 2001 and who could not be saved when their owners couldn't continue funding the team. At the 2019 College Draft in January, the attention was on Sky Blue FC, the subject of many unflattering stories about the New Jersey club's working and housing conditions for its players, and what its ownership group led by New Jersey governor Phil Murphy and its president and general manager, Tony Novo, were doing about it. Sky Blue FC's top two picks -- No. 2 pick Hailie Mace and No. 6 pick Julia Ashley -- chose the sign for teams in Sweden rather than play for Sky Blue FC. And on Tuesday, Novo, whose defensive status to the media scrutiny didn't help matters, resigned and was replaced by the club’s vice president, Alyse LaHue, on an interim basis. In February, the Seattle Reign announced that it was leaving Memorial Stadium -- the original home of the NASL Sounders in 1974 -- and moving to Tacoma, 35 miles south of Seattle, in a move forced because of what its owners, Bill and Teresa Predmore, termed a "constellation of challenges" that had contributed to a steady decline in support. The move came with a injection of new owners. The group operating the Rainiers and S2 took “a significant minority ownership stake’’ in the team, and Sounders owner Adrian Hanauer and his mother, Lenore, acquired minority ownership stakes. These problems point to a league with continuing growing pains -- but it's a league in better position than it was four years at the start of its first Women's World Cup year. The USA won the 2015 Women's World Cup, and the NWSL got a pre-tournament attendance boost. Average attendance jumped almost 23 percent from 2014 to 5,046 fans a game, marking the first time in the history of U.S. women's pro soccer that a league experienced a year-to-year increase in average attendance. Another attendance jump. The NWSL saw its average attendance again jump in 2018 to above 6,000 fans a game. While the Boston's demise left the NWSL with the same number of teams that it had four years ago, its average attendance has climbed 46 percent. 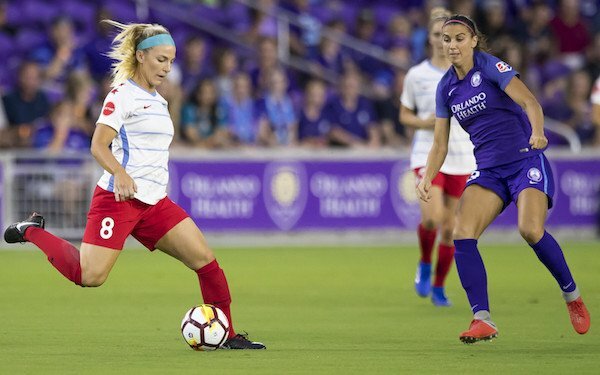 Every remaining team has seen an increase -- including Sky Blue FC -- since 2015, and the league traded Western New York for North Carolina, the reigning champion, and FC Kansas City for Utah, which averaged 9,466 fans a game. The NWSL salary cap still remains modest -- the offseason saw another round of young NWSL players announcing their retirements -- but it has more than doubled in the last four years from $200,000 to $421,500 with the maximum and minimum salaries now at $46,200 and $16,538, respectively. In France Football's annual "salaires des stars" issue on the top salaries of players and coaches around the world, it compiled for the first time a top 20 of the highest-paid women in the world (salaries and bonuses). The three highest-paid players play for French club Lyon -- Ada Hegerberg, Amandine Henry and Wendie Renard -- but 11 of the top 20 earners play in NWSL -- eight Americans, plus Brazilian Marta, Australian Sam Kerr and Canadian Christine Sinclair. Federation subsidies keep all the top Americans in the NWSL -- at least in a World Cup year -- but salaries offered by top European clubs in England, France, Germany and Spain can attract or keep most other top women's players. The caveat, though, is that only a dozen or so European women's clubs are offering competitive salaries, and many of their domestic rivals operate on semi-pro status. The sponsorship gap. Where the NWSL is slipping behind its European rivals is in terms of sponsorship. In December, Visa became the first sponsor of the UEFA Women's Champions League in a deal running until 2025. Barclays just signed on as the title sponsor of the FA Women's Super League in England, a three-year agreement valued at 10 million pounds ($13.1 million). On the television side, Mediapro signed a deal with the Spanish league to pay 3 million euros ($3.4 million) a year for three years for broadcast rights. In France, the value of the rights went up six-fold this season when Canal-Plus began broadcasting all Division I women's games this season for 1.2 million euros ($1.35 million) a year. One of the sore points with the A+E deal was that no new major sponsor came on board despite the communications company's connections. It's far simpler for a sponsor to sign one of the U.S. stars to an endorsement deal. The website ProSportsMedia reported that Orlando's Alex Morgan had deals with Nike, McDonald’s, Coca-Cola, Panasonic, Beats by Dre and Nationwide -- more sponsors than the NWSL has itself. As Morgan and her U.S. teammates go about trying to defend their world title this summer in France, they are the league's greatest asset and in some ways its greatest challenge. 2 comments about "NWSL continues to experience growing pains, but growth nonetheless". Mary lou Dymski, April 13, 2019 at 4:51 a.m.
Western New York Flash, my good man. Do you have a link to the French salaries of the stars? It could be informative to see the bottom of that chart- lowest paid players in various leagues. Also interesting observations about the USWNT player sponsorships vs. the league. R2 Dad, April 14, 2019 at 12:29 a.m. I would like to watch the league from the comfort of my own home--do any of these teams live-stream on a free platform? Even if it was on an existing pay platform--I currently have B/R Live and Fox Match Pass--would be good exposure and facilitate the growth of the game. If young female players can't easily watch their football idols, how do these corporate sponsors expect their investments to pay off?